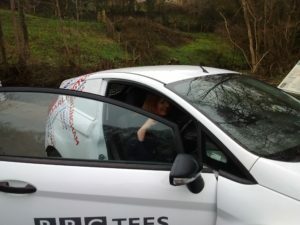 Whilst waiting for Amy Oakden the presenter of the breakfast show on Radio Tees (7am – 9am) to appear, Graham chatted to a minibus driver parked by the ford. 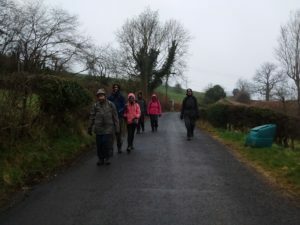 It turned out he was “the driver” for a family Coast to Coast walk by three generations stretching from grandmother to grandchildren. Two were from Stockton but others up from Lincoln. It es, of course, the last stretch to Robin Hood’s Bay and a celebratory meal that night. Here they are pictured as they walked down into Littlebeck out of deep mist up on top of the moor. Grandmother needed a toilet to save her from disgrace! In due course Amy arrived in a car suitably identifiable as BBC. Part of the delay was the signpost that was fiddled with that took the road to Littlebeck along a cart track. Same thing happened to Aussies Len & Ron last week and to Brian and Linda that morning!! We await the outcome of the interviews which we’ll post here when it appears..